If today’s slew of new music releases weren’t enough, the team behind Pass the Good has one more announcement—its second phase lineup—to sustain your music high over the long Labor Day weekend. Already announced during the first phase of this year’s sixth annual Pass the Good festival (October 6-8, 2017) were headliners like Thriftworks and Truth alongside fast-rising acts like Asadi, Cofresi, Levitation Jones, Gnar Gnar, and Moglee. 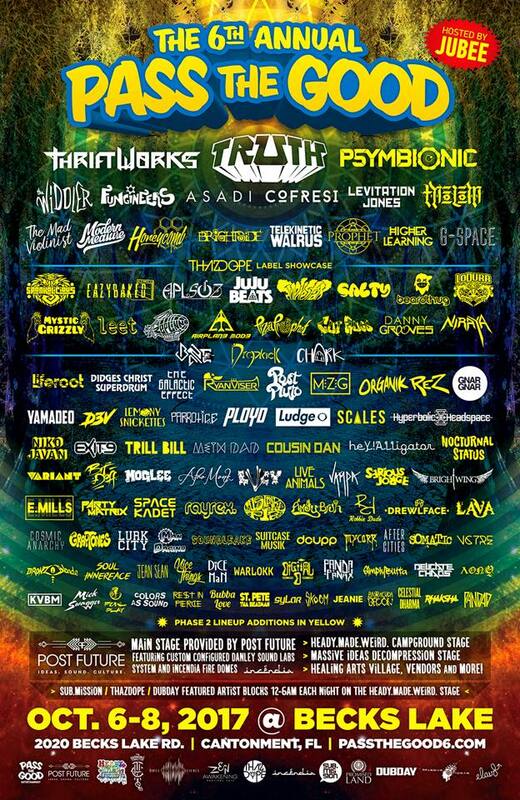 Today’s Phase 2 lineup includes not only the addition of headliner Psymbionic and other top-billed names like Honeycomb, Higher Learning, and Liferoot. But PTG has also announced more than a dozen new artists—SPANKALICIOUS, Salty, and EazyBaked among them—who’ll perform with previously announced JuJu Beats, Zeplinn, and more as part of a special ThazDope Records label showcase. These artists will appear across several stages at PTG’s new venue, Becks Lake in Cantonment, Florida. The various stages include: a main stage hosted by Post Future with sound courtesy of Danley Sound Labs plus an exclusive campground stage presented by Heady.Made.Weird. The Heady.Made.Weird. stage will also host a Dubday featured artist blocks from 12 a.m. to 6 a.m. each night. But with this second phase announcement also comes a jump in ticket prices to $120 (plus fees) for three-day general admission with camping passes, while tier one VIP tickets are still available for $210 (plus fees). In addition to a car camping pass, VIP holders also receive a limited edition print and pin by artist Chelsea Kemp and access to a TBA artist meet and greet. And as of last night, PTG was still offering a limited amount of tier one car camping passes, so get ‘em while you can. In short, pro tip: Don’t pass on this good-good. You can check out the brand new lineup below! And head here to get your tickets to pass the good!